K-129 was a Project 629A (NATO reporting name Golf II) diesel-electric powered submarine of the Soviet Pacific Fleet, one of six Project 629 strategic ballistic missile submarines attached to the 15th Submarine Squadron based at Rybachiy Naval Base, Kamchatka, commanded by Rear Admiral Rudolf A. Golosov. Fate: Sank on 8 March 1968 approximately 1,560 nautical miles (2,890 km) northwest of Oahu in the Pacific Ocean with all hands. 98 crewmen died. Status: Partially recovered in covert salvage operation by the CIA in 1974. In January 1968, the 15th Submarine Squadron was part of the 29th Ballistic Missile Division at Rybachiy, commanded by Admiral Viktor A. Dygalo. K-129's commander was Captain First Rank V.I. Kobzar. K-129 carried hull number 722 on her final deployment during which she sank on 8 March 1968. It was one of four mysterious submarine disappearances in 1968; the others being the Israeli submarine INS Dakar, the French submarine Minerve and the U.S. submarine USS Scorpion. The Soviet Navy deployed a huge flotilla of ships to search for her but never found her wreck. The United States attempted to recover the boat in 1974 in a secret Cold War-era effort named Project Azorian. The vessel's position 4.9 kilometres (16,000 ft) below the surface was the greatest depth from which an attempt had been made to raise a ship. The cover story used was that the salvage vessel was engaged in commercial manganese nodule mining. Only part of the submarine was recovered. K-129, having completed two 70-day ballistic-missile combat patrols in 1967, was tasked with her third patrol in February 1968, with an expected completion date of 5 May 1968. Upon departure on 24 February, K-129 reached deep water, conducted its test dive, returned to the surface to report by radio that all was well, and proceeded on patrol. No further communication was received from K-129, despite normal radio check-ins expected when the submarine crossed the 180th meridian, and when it arrived at its patrol area. This Soviet deployment in the Pacific was analysed by U.S. intelligence as probably in reaction to a submarine loss. U.S. SOSUS Naval Facilities (NAVFACs) in the North Pacific were alerted and requested to review recent acoustic records on 8 March 1968 to identify any possible associated signal. The Navy analyzed acoustic data from four AFTAC sites and the Adak, Alaska SOSUS array located the wreck of the submarine to within 5 nautical miles. The site was hundreds of miles away from where the Soviet Navy had been searching. Several SOSUS arrays recorded a possibly related event on 8 March 1968, and upon examination produced sufficient triangulation by lines-of-bearing to provide the U.S. Navy with a locus for the probable wreck site. One source characterized the acoustic signal as "an isolated, single sound of an explosion or implosion, 'a good-sized bang'. ":205 The acoustic event was reported to have originated near 40 N, 180th longitude. Soviet search efforts, lacking the equivalent of the U.S. SOSUS system, were unable to locate K-129, and eventually Soviet naval activity in the North Pacific returned to normal. K-129 was subsequently declared lost with all hands. The wreck of K-129 was identified by USS Halibut northwest of Oahu at an approximate depth of 4,900 metres (16,000 ft) on 20 August 1968. It was surveyed in detail over the next three weeks by Halibut – reportedly with over 20,000 close-up photos – and later also possibly by the bathyscaphe Trieste II. Given a unique opportunity to recover a Soviet SS-N-5 Serb nuclear missile without the knowledge of the Soviet Union, the K-129 wreck came to the attention of U.S. national authorities. President Nixon authorized a salvage attempt after consideration by the Secretary of Defense and the White House. To ensure the salvage attempt remained "black" (i.e. clandestine and secret) the CIA, rather than the Navy, was tasked to conduct the operation. Hughes Glomar Explorer was designed and built under CIA contract solely for the purpose of conducting a clandestine salvage of K-129. The salvage operation, named Project Azorian, would be one of the most expensive and deepest secrets of the Cold War. The location of the wreck remains an official secret of the United States intelligence services. However, Dr. John P. Craven points to a location nearly 40 degrees North, and almost exactly on the 180th meridian. CIA documents reveal that it sank "1,560 miles northwest of Hawaii," and that Hughes Glomar Explorer had to travel 3,008 miles from Long Beach, California, to reach the recovery site. The International Atomic Energy Agency states that two nuclear warheads from K-129 were located in the Pacific 1,230 miles from Kamchatka at coordinates 40°6'N and 179°57'E at a depth of 6,000 metres (20,000 ft), and lists them as recovered. All three distances point to a location of 38°5′N 178°57′E﻿ / ﻿38.083°N 178.950°E﻿ / 38.083; 178.950, which is close to 600 nautical miles (1,100 km) north of the Midway Atoll. The CIA gives 5,010 and 5,030 metres (16,440 and 16,500 ft) for its approximate depth. Seymour Hersh of The New York Times uncovered some of the details of Project Azorian in 1974, but was kept from publication by the action of the Director of Central Intelligence, William Colby. Months after the salvage operation was completed, in February 1975, the Los Angeles Times ran a brief story regarding the CIA operation, which led The New York Times to release Hersh's story. Jack Anderson continued the story on national television in March 1975. The media called the operation Project Jennifer, which in 2010 was revealed to be incorrect, since Jennifer referred only to a security system which compartmentalised Azorian project data. Hughes Glomar Explorer was publicly believed to be mining manganese nodules on the sea floor. Once the real purpose of Azorian was leaked to the media, however, the Soviet Union eventually found out about what happened. According to one account, in July–August 1974 Hughes Glomar Explorer grappled with and was able to lift the forward half of the wreck of K-129, but as it was raised the claw suffered a critical failure resulting in the forward section breaking into two pieces with the all-important sail area and centre section falling back to the ocean floor. Thus the centre sail area and the after portions of K-129 were allegedly not recovered. What exactly was retrieved in the section that was recovered is classified Secret Noforn or Top Secret, but the Soviets assumed that the United States recovered torpedoes with nuclear warheads, operations manuals, code books and coding machines. Another source (unofficial) states that the U.S. recovered the bow area, which contained two nuclear torpedoes,:111 but no cryptographic equipment nor code books. The United States announced that in the section they recovered were the bodies of six men. Due to radioactive contamination, the bodies were buried at sea in a steel chamber in September 1974, with full military honors about 90 nautical miles (167 km) southwest of Hawaii. The videotape of that ceremony was given to Russia by U.S. Director of Central Intelligence Robert Gates when he visited Moscow in October 1992.:359 The relatives of the crew members were eventually shown the video some years later. The K-129 recovery has been stated to have been a failure, recovering only a small amount of insignificant parts of the submarine. The CIA argued in a Freedom of Information Act lawsuit, however, that the project had to be kept secret because any "official acknowledgment of involvement by U.S. Government agencies would disclose the nature and purpose of the program." This response has entered the lexicon of legal jargon as the Glomar response or Glomarization; "neither confirm nor deny". As of 2018 the files, photographs, videotapes and other documentary evidence remain closed to the public. A few pictures appeared in a 2010 documentary showing the K-129 wreck: the bow and the sail, with the missile compartment heavily damaged showing only one missile tube left attached to the structure. The official Soviet Navy hypothesis is that K-129, while operating in snorkel mode, slipped below its operating depth. Such an event, combined with a mechanical failure or improper crew reaction, can cause flooding sufficient to sink the boat. Intentional or unintentional scuttle by crew due to K-129 violating normal operating procedures and/or departing from authorised operating areas. Reportedly, as many as 40 of the complement of 98 were new to the submarine for this deployment. Lead–acid batteries vent explosive hydrogen gas while charging. The hydrogen gas, if not properly vented, could have accumulated into an explosive concentration. It was standard practice during the Cold War for U.S. Navy attack submarines to trail Soviet missile submarines as they departed their home ports and moved into the North Pacific or the North Atlantic Ocean. The collision hypothesis is the unofficial opinion of many Soviet Navy officers, and is officially denied by the U.S. Navy. According to U.S. Navy sources, USS Swordfish put into Yokosuka, Japan on 17 March 1968, shortly after the disappearance of K-129, and received emergency repairs to a bent periscope, reportedly caused by ice impacted during surfacing while conducting classified operations in the Sea of Japan. The USS Pueblo seizure by the North Korean government occurred in the Sea of Japan on 23 January 1968, and the U.S. Navy response to this incident included the deployment and maintenance of naval assets in the area off the eastern North Korean coast for some time thereafter. As recently as 1999, Russian government officials complained that Washington was covering up its involvement. One accused the Americans of acting like a "criminal that had been caught and now claimed that guilt must be proved," according to the notes of a U.S. participant in a November 1999 meeting on the topic. On 3 October 1986 the Soviet Yankee-class ballistic missile submarine K-219, while on combat patrol in the Atlantic, suffered the explosion of a liquid-fuelled SS-N-6 missile in one of its 16 missile tubes. The cause of the explosion was a leaking missile tube hatch seal. The leak allowed sea water to come into contact with residue of the missile's propellants, which caused a spontaneous fire resulting in an explosion first of the missile booster, then a subsequent explosion of the warhead detonator charge. In the case of the Yankee-class ballistic missile submarine, the missiles were located within the pressure hull and the explosion did not cause damage sufficient to immediately sink the boat. It did, however, cause extensive radioactive contamination throughout, requiring the submarine to surface and the evacuation of the crew to the weather deck, and later to a rescue vessel which had responded to the emergency. Subsequently, K-219 sank into the Hatteras Abyss with the loss of four crewmen and rests at a depth of about 5,500 metres (18,000 ft). The Soviet Navy later claimed that the leak was caused by a collision with USS Augusta. There are indicators suggesting K-129 suffered a similar explosion in 1968. First, the radioactive contamination of the recovered bow section and the six crewmen of K-129 by weapons grade plutonium indicates the explosion of the warhead detonator charge of one of the missiles, before the ship reached its crush depth. The report that the forward section was crushed and that charring in the bow section indicated dieseling from an implosion (or alternatively from a fire), would indicate that the explosion occurred while K-129 was submerged and at depth. The report found in Blind Man's Bluff that the wreck revealed K-129 with a 3-metre (10 ft) hole immediately abaft the conning tower would support the theory of an explosion of one of the three missiles in the sail (possibly missile #3). Since K-129's missiles were housed in the sail, much less structural mass (compared to the Yankee-class) was available to contain such an explosion, and loss of depth control of the submarine would be instantaneous. Craven does not explain why he eliminated the possibilities that K-129 was proceeding to a newly assigned and officially approved patrol area, or using a new track to an established patrol area, nor why he concluded that K-129 was acting in an abnormal or criminal manner for a Soviet strategic missile submarine. Anatoliy Shtyrov (Анатолий Штыров), a former Deputy Chief of the Soviet Pacific Fleet intelligence, has said that K-129 would normally patrol an area off the west coast of the United States but it was sent on an unscheduled combat patrol in the eastern Pacific only 1½ months after returning from its regular scheduled patrol. Vladimir Evdasin (Владимир Евдасин), who from June 1960 to March 1961 served aboard K-129, states that K-129 was sent on a secret mission in response to the massive U.S. naval force build-up off the Korean coast after the Pueblo incident. K-129's mission was in support of North Korea, which was an ally of the Soviet Union, and directed against U.S. naval operations, Pacific bases and U.S. maritime support lines to South-east Asia. In August 1993, Ambassador Malcolm Toon presented to a Russian delegation K-129's ship's bell. :262 According to Red Star Rogue, this bell had been permanently attached to the middle of the conning tower of K-129, thus indicating that in addition to the bow of the submarine, the critical and valuable midsection of the submarine was at least partially recovered by Project Azorian. Additionally, Ambassador Toon is quoted from the 6th Plenum of the U.S.–Russia Joint Commission on POW/MIAs :262 as stating, "Our director of naval intelligence has concluded that no U.S. sub was within 300 nautical miles of your sub when it sank". Red Star Rogue places K-129 at 24 degrees north latitude by 163 west longitude, less than 350 miles from Honolulu. This site is consistent with the discovery of radioactive oil:216 reported to the Hawaii Institute of Geophysical Research at the time. The premise of Red Star Rogue is that a fail-safe device designed to be activated in the event of an unauthorised fire command of its nuclear missiles caused two catastrophic explosions (monitored by U.S. technology at the time) resulting in sinking the submarine. The 11 extra crewmen have never been satisfactorily identified, and K-129's crew manifest was listed as missing by Russian authorities. An ID photograph of a sailor found in the wreck has never been identified. Red Star Rogue claims the changing relations with China and Russia in the early 1970s, forged by Nixon and Kissinger, were enabled by the K-129 incident. A retired United States Navy Captain Peter Huchthausen, and former naval attaché in Moscow, said he had a brief conversation in 1987 with Admiral Peter Navojtsev, who told him, "Captain, you are very young and inexperienced, but you will learn that there were some matters that both nations have agreed to not discuss, and one of these is the reasons we lost K-129." In 1995, when Huchthausen began work on a book about the Soviet underwater fleet, he interviewed a Russian Navy Admiral Victor Dygalo, who stated that the true history of K-129 has not been revealed because of the informal agreement between the two countries' senior naval commands. The purpose of that secrecy, he alleged, is to stop any further research into the losses of USS Scorpion and K-129. Huchthausen states that Dygalo told him to "overlook this matter, and hope that the time will come when the truth will be told to the families of the victims." As a gesture of intent, a symbol of a new era, I carried with me the Soviet naval flag that had shrouded the coffins of the half dozen Soviet sailors whose remains the Glomar Explorer had recovered when it raised part of a Soviet ballistic missile submarine from deep in the Pacific Ocean in the mid-1970s, I also was taking to Yeltsin a videotape of their burial at sea, complete with prayers for the dead and the Soviet national anthem – a dignified and respectful service even at the height of the Cold War. Gates's decision to bring the videotape of the funeral held for the men on the Golf was ultimately motivated by the fact that the United States wanted to inspire Russia to offer up information on missing American servicemen in Vietnam. Before that, "We had never confirmed anything to the Russians except in various vague senses," he said in an interview. Shortly after the USSR collapsed, the Bush administration had told the Russians through an intermediary that we couldn't tell them any more about what had happened on Golf/Glomar. But then when we started asking the Russians about what had happened to U.S. pilots shot down over Vietnam, and if any U.S. POWs had been transferred to Russia and held there, they came back and said, "What about our guys in the submarine?" At the time, the administration told the Russians only that there were no survivors and that there were only scattered remains. American officers have refuted the Russian charge made early on that American nuclear attack submarine U.S.S. Swordfish was the U.S. submarine involved – a charge based solely on the latter's reported arrival in the Ship Repair Facility, Yokosuka, Japan, on 17 March 1968, with a badly damaged sail. Retired U.S. Navy Admiral William D. Smith informed Dygalo by letter following a 31 August 1994, meeting of a Joint U.S./Russia Commission examining questions of Cold War and previous war missing, that the allegation of Swordfish's involvement was not correct and that Swordfish was nowhere near the Golf on 8 March 1968. The joint commission, headed by General Volkogonov and Ambassador Toon, informed the Russians that no U.S. submarines on 8 March 1968, had been within 300 nautical miles (560 km) of the site where the K-129 was found. Phantom (2013 movie), loosely based on the story of K-129. ^ "629 GOLF – Russian and Soviet Nuclear Forces". Federation of American Scientists. 2012. Retrieved 11 September 2012. ^ "K-129 (6124943)". Miramar Ship Index. Retrieved 22 September 2009. ^ a b c d Project Azorian: The Story of the Hughes Glomar Explorer, a CIA declassified Secret Noforn document from the mid-1980s. ^ "Sub Pirates World Submarines". www.cliffhangershideout.com. Retrieved 3 January 2019. ^ "Operation Azorian: How America Stole a Soviet Submarine — Defensionem - The WarBible | Everything About Defense". Defensionem - The WarBible | Everything About Defense. 9 April 2017. Retrieved 3 January 2019. ^ "Inventory of accidents and losses at sea involving radioactive material, IAEA-TECDOC-1242, Appendix I.3" (pdf). International Atomic Energy Agency. September 2001. Retrieved 18 February 2010. ^ Norman Polmar; Kenneth J. Moore (2004). 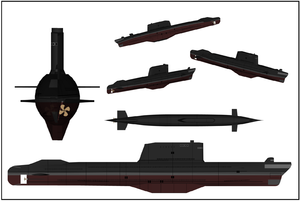 Cold War Submarines: The Design and Construction of U.S. and Soviet Submarines. Potomac Books, Inc. ISBN 978-1-57488-594-1. ^ Burial At Sea of Soviet Submariners from Hughes Glomar Explorer. Central Intelligence Agency. 25 August 2014 – via YouTube. ^ Philippi v. CIA (Turner et al.) , 211 US App. D.D> 95 (US Court of Appeals 25 June 1981). ^ Toth, Robert C. (17 June 1985). "Change in Soviets' Sub Tactics Tied to Spy Case: Material Reportedly Available to Walkers May Have Tipped Kremlin to Vessels' Vulnerability". Los Angeles Times. Retrieved 2 January 2011. ^ Shtyrov, Anatoliy (14 June 2008). "The tragedy of submarine K-129: Behind the scenes of operations "Jennifer"" (in Russian). flot.com. Retrieved 19 February 2010. ^ Newton, Robert E. (1992). "The Capture of the USS Pueblo and Its Effect on SIGINT Operations" (pdf). U.S. Cryptologic History, Special Series, Crisis Collection, Vol. 7, NSA. Retrieved 19 February 2010. ^ Evdasina, Vladimir (14 June 2008). "K-129: How was it?" (in Russian). flot.com. Retrieved 20 February 2010. ^ "Has the "Fire!" Command Sounded in the Compartments of the Cold War?". rusnavy.com. Retrieved 20 February 2010. ^ Sewell, Kenneth (2005). Red Star Rogue. Simon&Schuster. ISBN 0-7432-6112-7. ^ Gates, Robert (1996). From the Shadows. Touchstone. pp. 553–54. ISBN 0-684-81081-6. ^ Sontag, Sherry (1998). Blind Man's Bluff: The Untold Story of American Submarine Espionage. Harper. p. 486. ISBN 0-06-103004-X. ^ Huchthausen, Peter (2002). K19, The Widowmaker. National Geographic Society. p. 177. ISBN 0-7922-6472-X. Sewell, Kenneth (2005). Red Star Rogue: The untold story of a Soviet submarine's nuclear strike attempt on the U.S. New York: Simon & Schuster. ISBN 0-7432-6112-7. Polmar, Norman (2004). Cold War Submarines: The Design and Construction of U.S. and Soviet Submarines. Dulles: Potomac Books. ISBN 978-1-57488-594-1. Podvig, Pavel (2001). Russian Strategic Nuclear Forces. Cambridge, Massachusetts: MIT Press. ISBN 0-262-16202-4. Sharp, David (2012). The CIA's Greatest Covert Operation: Inside the Daring Mission to Recover a Nuclear-Armed Soviet Sub. Lawrence, KS: University Press of Kansas. p. 344. ISBN 978-0-7006-1834-7. Archived from the original on 28 July 2012. Dean, Josh (2017). The Taking of K-129 : How the CIA Used Howard Hughes to Steal a Russian Sub in the Most Daring Covert Operation in History. New York, NY: Penguin Publishing Group. p. 448. ISBN 9781101984437.